Creating a website is just the beginning. Merely existing is not enough to draw attention to attention to your site. The best way to do that is to utilize to partake in a little Search Engine Optimization (SEO) to catapult your site to the front page! A better website means more traffic and more people buying your services. The key to SEO is adding content laced with the right keywords, but before you can build an amazing site, you have to understand the foundation. Simply put, these are the words or phrases in your website’s content that make it possible for people to find your site via search engines like Google, Yahoo or Bing. As Google currently holds nearly 80% of the market for search engines, a high Google ranking is generally the goal. Strong keywords get you there, and they’re often very straightforward. For example, if you were selling travel mugs, then one of your keywords should be “Travel Mugs.” If you’re a lawyer and your biggest practice area is personal injury, then your keywords should be centered around “Personal Injury” and pertinent variations of that. These help Google and other search engines zero in on your content and direct people looking for it to the page. There are two different kinds of keywords; head keywords and long-tail keywords. The ones we just talked about are often referred to as Head Keywords or Seed Keywords. These are broad and far-reaching but can sometimes be too broad. These kinds of keywords (like Travel Mugs or Personal Injury) can be a challenging and saturated market to break into as the competition for these head keywords is often quite fierce. They also tend to be maddeningly vague. What kind of travel mugs: big ones, small ones, green ones, themed ones, specially styled ones, etc.? In this case, refining the keyword to more accurately describe the kind of travel mugs you sell will better help you target the customers you’re going after. This specialty will be your niche and entry point into the online market. In this case, you would want your keyword to be more specific with several relevant terms attached to it. So using our mug example, let’s say we’re going to specialize our travel mugs and make them sturdy and nerdy. Our long-tail keyword can be something like “Sturdy Sci-Fi Themed Travel Mugs” or “The Best Science Fiction Travel Mugs.” These keywords are much more specific, allowing you to connect to a narrower group of people who are more likely to convert into paying customers. Without keywords, people won’t find you organically. Local word of mouth amongst your friends and family can help build traffic and garner attention, don’t count as organic traffic. They’re instead referred to as direct traffic. While vital to your success, relying on direct traffic makes it a lot harder to grow your business. On the other hand, organic traffic is anyone that finds your website naturally by typing or speaking into their search engine words or phrases that are the same or similar to your keywords. If we take our travel mug keyword as an example, within the Los Angeles area “Travel Mugs” was searched roughly 12,000 times in the last month. Not too bad. That’s a full market you could tap in to. Now, what’s easier? Interacting with and relying on word of mouth to get to those 12K people by offering them your URL or company name (direct traffic), or targeting your keywords so that your website pops up whenever that group searches for “Travel Mugs” (organic traffic)? Organic traffic is undoubtedly easier on your feet and business cards. The number of people searching online every day is staggering. According to a Pew Research Center poll, on any given day, 38 million Americans and many more worldwide will use a search engine. Even if you could only tap into a teeny tiny slice of that, that’s still a huge potential market! The other primary reason keywords are so important is that they help search engines understand what’s on your page when they crawl through it. If the content on your page is relevant to the keywords you’re choosing, this will positively affect how you rank in those searches and hopefully get you on the front page. The simple answer is they let you reach a broad audience and help search engines understand your pages with relatively minimal effort. Research, research, research. Think about how you can carve out a small part of the internet just for yourself, better known as your niche market. It’s always better to start small and grow your online presence than to start big and try to compete with everyone else already established. Once you know your niche market, think about how people will be searching for your product. 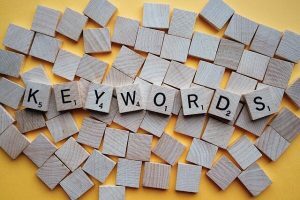 Start small with head keywords and then build them into long-tail keywords to cover several variations of your main keywords to maximize your product’s exposure to the internet. There are also many third-party tools available. SpyFu and SEM Rush allow you to input keywords and see their local and global searches per month along with other relevant data like “cost per click” and the number of advertisers for specific keywords. You can also use SpyFu to check out your competition and see what their keywords are and if they utilize pay per click campaigns (PPC). Moz is another tool that’s good at giving you an idea of how powerful a website’s presence online is, and Google analytics is great for tracking and reporting website traffic. You can put in all that effort, or you can leave it to us! Navigating the nuances of SEO keywords can be complicated and confusing, but we at Performance First Marketing are here to help. Contact us to learn more about how to improve your online presence and grow your practice.